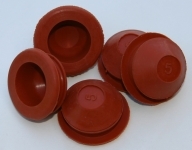 Red/brown colour rubber stopper suitable for salt or pepper shakers. Fits hole 20mm diameter. Sold as a single.